As Monterey County’s Top Rated® Local sign company, we have served as the professional sign making company for businesses throughout Salinas, California and Monterey County. What many people don’t know about Signs By Van is that making signs is more than an advertisement tool, it’s art and it’s our passion. If you are a business owner in Monterey County looking for a unique and artistically designed custom sign to represent your brand, look no further than Signs By Van. We have mastered the art of creating beautiful custom signage for our clients that you can’t get anywhere else. 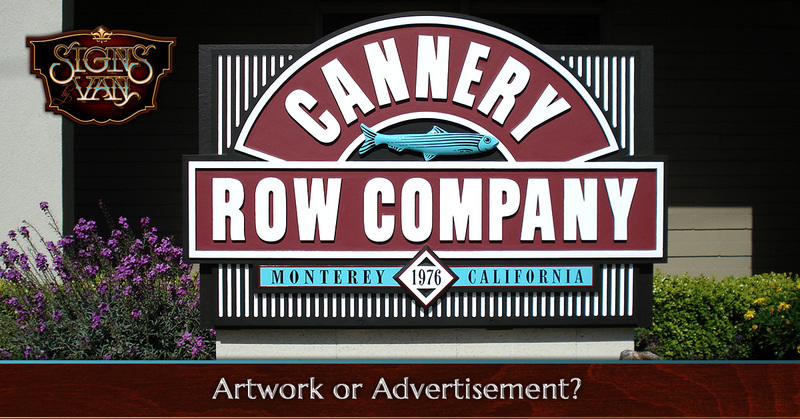 In today’s article, we’ll discuss the importance of incorporating artwork as we create custom signs for businesses and clients throughout Monterey County. Be sure to visit our site and browse our portfolio of custom metal, wood, and personalized signs, then contact us to schedule a consultation to design your business sign. Custom sign carving is a great way to personalize your business’ representation through artistic craftsmanship.The fine and intricate details that are included in the sign making process is what makes an incredible impact in your business’ marketing plan. Our professional artists carefully carve the signs by hand into bright, bold signage that is sure to catch the eye of every passerby. Carving is an artform that consists entirely of three-dimensional art, and the in-house artists at Signs By Van have a keen eye for detail to create the best wood sign for any business. The carving process begins with a free consultation to discuss options and brainstorm ideas. Once the sign maker and the client agree on designs, they will move forward with the carving and design process. The carving and design phase will take time based on the complexity and size to finalize, but once they are finished, the signs get their final touch with the most durable paints and protective layers so your signs lasts for years to come. Painted wall murals is truly a work of art with the ability to alter the mood and atmosphere in any given space. Murals have so much variety that businesses will choose to use them indoors to create a particular mood, while outdoor murals are used as a marketing and advertising technique. Signs By Van is proud to have partnered with a worldclass muralist that comes with 45 years of mural painting experience. His talents and picturesque artwork can be found throughout California, the United States, and even around the world. Signs By Van is truly fortunate to have him be apart of our sign making business creating masterpiece murals for our clients in Monterey County. Dimensional signs are creative alternatives to the standard sign fabrications that we’re used to seeing on business store fronts. The sky is the limit when it comes creating dimensional signs, and Signs By Van has mastered their techniques to design and build a sign that stands out among the crowd. Whether the sign is made from metal or wood, all of the sign fabrication is made in-house and never outsourced, this way we can ensure the highest quality and uniquely crafted design. Signs By Van has been in the sign making industry for over 30 years, and look forward to creating your business sign. Visit our portfolio and contact us for a free consultation today!